Best performing mulch natural weed suppressant available. Provides a decorative natural looking mulch finish for beds, borders and pots. Reduces weed growth and retains moisture in the soil. Made from the bark of Larch trees. 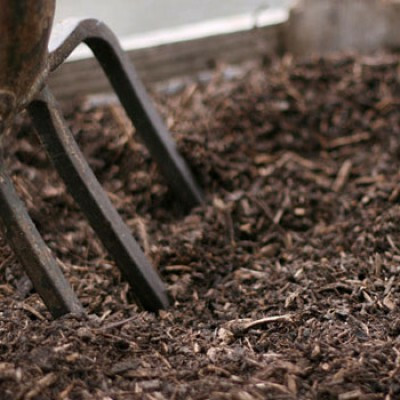 Mulch fine bark is specially formulated by us so that it is uniform in size and a darker shade. Apply to the designated area 50mm to 75mm deep on flat sheltered areas and up to 100mm thick on uneven ground. Never lay on a weed control membrane. The bark requires moisture from the bed to prevent it from drying out and blowing away. Prior to application spray weed killer or remove any weeds from the soil. Replenish bark annually to maintain constant superior look and effective weed suppression. Grips and clings to the soil forming a thick dense mulch that is less likely to blow away. Improved weed suppression as no light can get through to the soil. Birds are less likely to pick at it. It does not bleach and get dirty looking. You can dig it in and add soil enricher without removing it. The secret to making your garden look super!